When it comes to beautifying your home, garages are the most ignored place. But, overlooking the garages harms your home’s curb appeal as well. With this in mind, let’s look at some ways that your garage curb appeal can be enhanced. When it comes to enhancing the aesthetic charm of a house, flooring is a must. Of course, floors are an important part of every home. So, garage flooring is no different. Are you planning to give a good look for your garage floor? 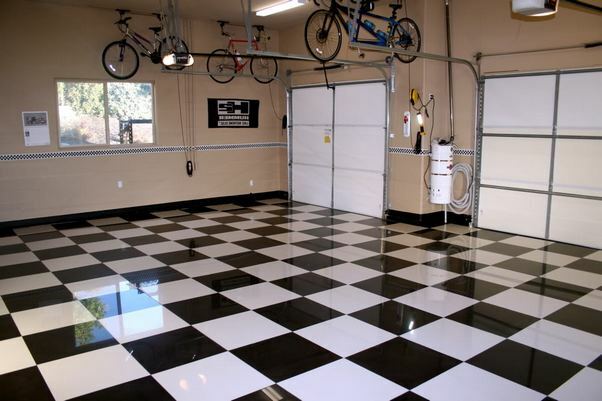 If yes, here are the 5 fabulous flooring ideas for your garage. If you pick epoxy coating, it’s crucial to search for a right epoxy coating for floors. On the other hand, if you are looking for something simpler, you can paint your garage floor. It is simple as well as quite short projects. One of the benefits is that you have a huge choice of colors, and it is much less expensive. It is a good protective option and decision for your home garage. It is strong and a very popular option by house owners. Many people use their garages not only for car parking or storage, but for other purposes as well. If you are one of them and you need to transform your garage into a more comfortable place, installing a Vinyl composite tiling could be a perfect idea. If you’re a home mechanic or use to work in your garage, a rubber garage flooring is a good option. There are a few producers that offer modular surfaces made of polypropylene copolymer. This puts a good protection between your car and your garage floor, and the damage that a few chemicals like oil, brake liquid, grease, can do to your garage floor. Most of the people pick a larger flake floor with more natural shimmer. If you chose to paint, then don’t hesitate to use the wet paint as your epoxy resin. Paint an area, then apply the sparkle, paint some more, apply sparkle and so on. When the paint dries, take a soft brush to expel the extra loose sparkle that did not stick to it. Although you’ll be fed-up of performing this flooring idea, but it is a very important way, which requires time and patience to seal your floor. Clear concrete sealer is one of the least-expensive options, and it’s very easy to apply. It’s a topical garage floor coating that secures your flooring against water, chemicals, oil and street salts. Application is easy, so you can even do it yourself. It won’t cover up imperfections, so it’s ideal if your garage floor is free of stains and splits. It can’t be used over existing paints and epoxy coatings, but it will add a guarantee to concrete stains and dyes. Keep up the curb appeal of your home by maintaining your garage as well. With the help of these above 5 ideas, you can never go wrong. Which idea you picked or picking for your garage enhancement? Do share with us in the comments given below!